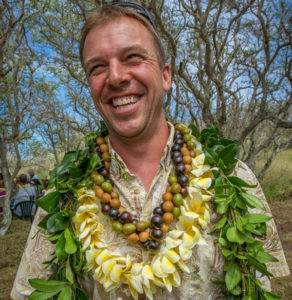 Butch Haase is the current and founding Executive Director for Moloka’i Land Trust. As Moloka’i Land Trust Executive Director, Butch has managed acquisition and permanent protection of nearly 2,000 acres and five miles of shoreline on Moloka’i Land Trust’s Mokio and Kawaikapu Preserves. The Molokai Land Trust has initiated one of the state’s largest coastal and dune restoration projects spanning 3/4 of a mile of shoreline and 60 acres on the Mokio Preserve on Molokai’s NW coast. Completed $1.5M New Markets Tax Credit funding deal for Moloka’i Land Trust’s new Operations and Service Learning Center and native plant nursery currently under construction in Kualapuu`u, Molokai. Holds permit for Threatened and Endangered Species through DLNR DoFAW, and works with the Plant Extinction Prevention Program on the recovery of PEPP species across Molokai. Assists The Nature Conservancy with understory transect monitoring in the mauka portions of the island, forest bird surveys, and seabird banding at Mo`omomi. Also oversees contracted work through The Nature Conservency on restoration activities at its Mo`omomi Preserve which is adjacent to Moloka’i Land Trust’s Mokio Preserve. Consults with The Nature Conservency on restoration strategies for its Kanepu`u Preserve on Lanai, and the Hawaii Rare Plant Restoration Group on the Abutilon menziesii mitigation sites on Oahu. Worked with USFWS Coastal Program and American Bird Conservancy on an 85 acre Predator Proof Fence project on Moloka’i Land Trust’s Mokio Preserve to protect ground nesting seabirds, native pollinators and rare plant communities. Butch sits on the USDA NRCS State Technical Advisory Committee, Hawaii State Legacy Lands Conservation Commission, MoMISC Committee, East Molokai Watershed Partnership, and is involved with a series of other organizational partnerships connected to the restoration work occurring on Moloka’i Land Trust lands. Works with local schools providing service-learning and STEM related work with Moloka’i Land Trust staff on restoration projects, and provides AmeriCorps internships for island youth through KUPU. William “Butch” Haase, since 1995, proudly dedicating his efforts to removing invasive species and restoring native ecosystems on Moloka’i.